Some of the statements coming from the current U.S. administration around Islam and people from certain Muslim majority countries may have been disheartening for those seeking to building strong inter-faith relations. But the response of Jewish and Christian communities in the small Texas town of Victoria after a local mosque burned to the ground, have highlighted the American spirit of generosity that the world had long come to expect. After the mosque in Victoria was razed the weekend, the local Jewish and Christian communities there have come together to help those affected, Time magazine reported. The early-morning fire on Jan. 28 destroyed the Texas mosque that was a target of hatred several years earlier and experienced a burglary only a week before it burned down, The Associated Press reported. A convenience store clerk spotted smoke and flames billowing from the Islamic Center of Victoria at around 2 a.m. and called the fire department. Victoria Fire Marshal Tom Legler asked for help from the Texas Fire Marshal's Office and federal Bureau of Alcohol, Tobacco, Firearms and Explosives to determine the cause of the blaze. Hashmi said authorities had told him it was too early to speculate. Members of the B'Nai Israel temple, however, gave the keys to their synagogue to the Muslim community so they would have a place to worship, USA Today reports, and four churches in the town also offered space for the mosque's Muslim congregation to hold services, according to NPR. "Jewish community members walked into my home and gave me a key to the synagogue," Dr. Shahid Hashmi, a co-founder of the Victoria Islamic Center, told The New York Times. "We were very happy to do this," Melvin Lack, treasurer of Congregation B'Nai Israel told USA Today. "You feel what's happening in the community and everyone reacts." Only hours before the fire occurred, President Donald Trump had announced the controversial executive order that bans immigrants from seven Muslim-majority countries, said USA Today. The cause of the incident hasn't, however, been determined yet, and authorities there are still investigating. 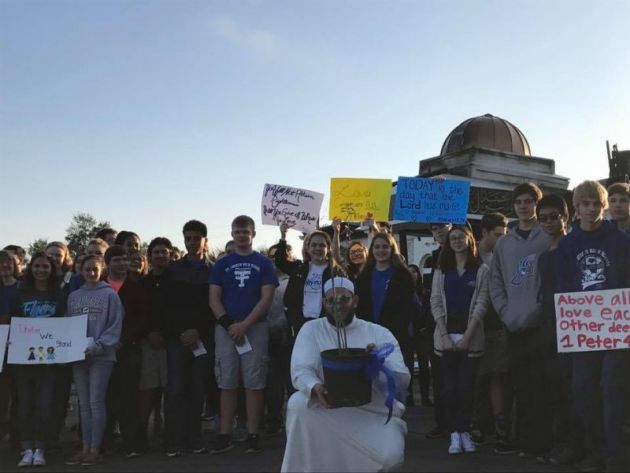 "We are praying that it is an accident because the thought of actually somebody doing something terrible like that is beyond imagination," said Abe Ajrami, a member of the mosque, according to the Advocate. Children from a Catholic school in Victoria also visited the mosque on a few days after it burnt down, forming what the Islamic Center called a "human chain of love and peace," the center's Facebook page recorded. The students also presented the Muslim community with a tree. "The tree will be planted in the grounds of our new mosque & prominently displayed to remind us of this beautiful moment," the post reads. "This is the spirit of love where the cross hugs the crescent." In addition, the Islamic Center also received financial support: a GoFundMe page raised more than $1 million for reconstruction, within days of the fire. Dr. Hashmi, a surgeon who in 2000 helped found the Victoria Islamic Center, said that both an online fund-raising campaign and separate offerings of cash and checks from the local community had pushed total donations over $900,000 only two days after the fire, The New York Times reported. The money will go toward rebuilding the 4,000-square-foot (372 square meter) prayer and community center in Victoria, home to about 66,000 people, about 100 miles southwest of Houston. It was the only Muslim community center and place of worship for some 40 Muslim families in the city, Hashmi said.